"We currently see no delay in the ramp of Apple's upcoming flagship 5.8-inch or 6.5-inch OLED iPhones," said Morgan Stanley analyst Katy Huberty in a note seen by Barrons, indicating the two models accompanying the LCD version are seemingly on schedule for launch later this year. "However suspected issues with LED backlight leakage have caused a 1-month delay in mass production of the 6.1-inch LCD iPhone," the analyst warns. It seems that Apple anticipated production issues for the new devices, with suppliers advising Huberty the four weeks "is down from a 6-week delay baked into the original production forecast." A delay in mass production gives Apple's suppliers and assembly partners less time to build iPhones in time for its launch. The months immediately after the refresh are typically Apple's best for iPhone sales, so having ample supplies of iPhones to sell over the holiday shopping season is crucial. At worst, the one-month production delay could push Apple to release the LCD model at a later time to the OLED versions, but Apple has previously staggered the release of its products, something it could easily do again. For example, the iPhone 8 started shipping in September last year, while the iPhone X landed the following November. This is not the only claim that the LCD model is causing production issues. A report from early June cited "light leakage" problems with the display, in part caused through the limitations of LCD and Apple's intention to retain the notch across all of this year's models. From an engineering standpoint, OLED is easily capable of being cut and folded, as its ability to work without a backlight means it can be produced on a somewhat flexible substrate. LCD screens need the backlight, making them thicker and less capable of being used for an edge-to-edge display with rounded corners and a cut-out section at the top. 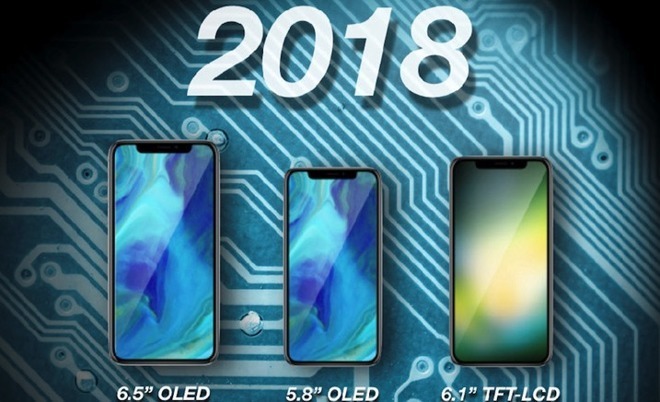 Apple is currently thought to be producing three different iPhone models for 2018, with two OLED-based versions alongside the 6.1-inch LCD edition. The LCD model is expected to be the cheaper model of the three, with reduced specifications to match, while the OLED versions will continue to be premium models with high-end components.